This is a great option if once in a while you like to throw in a meatless option. We eat everything around here but I am always up for 1 or 2 nights of no animal protein and extra veggies! 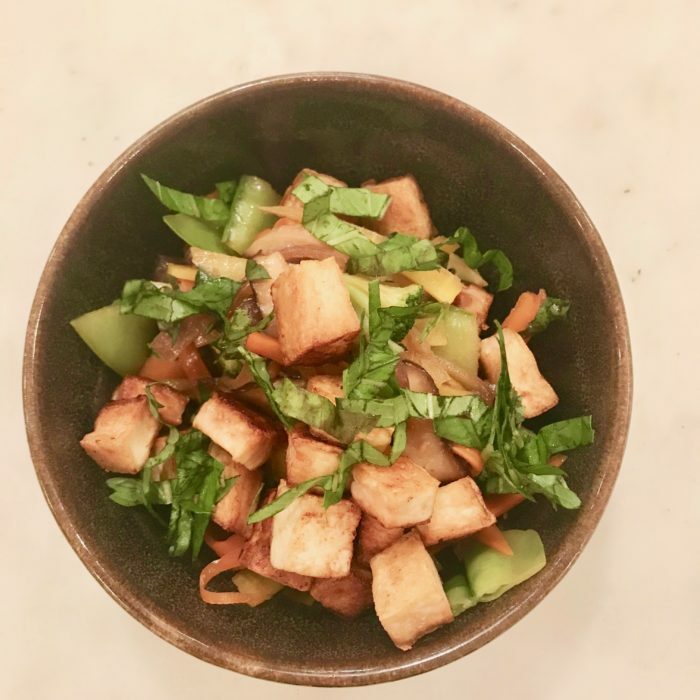 Dry the tofu and cut into small cubes. Heat up 1 tbsp of avocado oil and cook the tofu for a couple of minutes on each side until golden and crispy. Set aside when cooked. In the same pan heat the rest of the oil and start by cooking the onion for 2-3 minutes, then add the mushrooms and carrots for another 2 minutes. Finally toss in the snow peas and broccoli. Drizzle the soy sauce and rice vinegar, taste and adapt seasoning. Toss it all together and sprinkle the fresh basil on top. Enjoy on its own or with rice, caulirice or noodles.